Albanians in Serbia (Albanian: Shqiptarët në Serbi; Serbian Cyrillic: Албанци у Србији) are an officially recognized ethnic minority in Serbia. An estimate of 50,000–80,000 Albanians live in Serbia out of whom majority live in the municipalities of Preshevo (Albanian: Preshevë), Bujanovac (Albanian: Bujanoc), and part of the municipality of Medveđa (Albanian: Medvegjë). According to the results of the 2002 census, there are 61,467 Albanians who live in Serbia. Most Albanians boycotted the 2011 census, which resulted in only 5,809 Albanians being recorded as living in Serbia. In the municipalities of Preševo and Bujanovac Albanians form the majority of population (89.1% in Preševo and 54.69% in Bujanovac according to the 2002 census). In the municipality of Medveđa, Albanians are second largest ethnic group (after Serbs), and their participation in this municipality was 28.67% in 1991 and 26.17% in 2002. The region of Bujanovac and Preševo is widely known as the Preshevo Valley (Serbian: Прешевска Долина, Preševska Dolina, Albanian: Lugina e Preshevës). There is a small community of Albanians in the Pešter region of Sandžak living in villages such as Boroštica, Doliće and Ugao. For the past two generations these villages have become partly bosniakicised, due to intermarriage with the surrounding Bosniak population. As such and also due to the Yugoslav wars and thereafter, they have opted to declare themselves in censuses as "Muslims" and "Bosniaks" instead of as Albanians to avoid problems. Elders in these villages are still fluent in Albanian. In 1992, the Albanian representatives in the municipalities Preševo, Medveđa and Bujanovac organized a referendum in which they voted for the joining of these municipalities to the self-declared assembly of the Republic of Kosova. 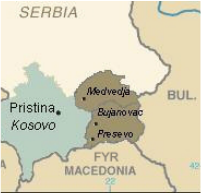 Between 1999 and 2001, an ethnic Albanian guerilla organization, the Liberation Army of Preševo, Medveđa and Bujanovac (in Albanian Ushtria Çlirimtare e Preshevës, Medvegjës dhe Bujanocit, UÇPMB), was operational in this region with a goal to secede these three municipalities from the FR Yugoslavia and join them to Kosovo upon achieving independence. The activities attracted less international media interest than the related events of Kosovo and Macedonia. Since then, the Albanian Coalition from Preševo Valley has gained representation in the National Assembly of Serbia where it holds two seats. Education in Albanian is provided for primary and secondary schools. There may be some university-level courses provided in Albanian, in the capital of Serbia, Belgrade, but students mainly do their university degree in the University of Prishtina in the Republic of Kosovo, in Macedonia, or in Albanian Universities. The main religion of Albanians in this region is Islam. Prior to the Ottoman invasion of the Balkans, the population of the Preševo Valley was mostly Roman Catholic. There are still Catholic churches in the Karadak villages, located in Kosovo today. Belgrade has a minor Albanian community. In the census of 1981, 8,212 Albanians were registered. In 1991 there lived only 4,985 Albanians in Belgrade. After the Kosovo War, this number decreased to 1,492, and according to the latest census (2011), the number is 1,252. Jonuz Musliu, head of the UCPMB political wing. Donika Nuhiu, well-known pop singer. Partos, Gabriel (2 February 2001). "Presevo valley tension". BBC. Retrieved 14 January 2015. Initially, the guerrillas' publicly acknowledged objective was to protect the local ethnic Albanian population of some 70,000 people from the repressive actions of the Serb security forces. "2011 Census of Population, Households and Dwellings in the Republic of Serbia: Ethnicity" (PDF). Belgrade: Statistical Office of the Republic of Serbia. 2012. Retrieved 17 February 2015. Popis stanovništva, domaćinstava i Stanova 2002. Knjiga 1: Nacionalna ili etnička pripadnost po naseljima (in Serbian). Statistical Office of the Republic of Serbia. 2003. ISBN 86-84433-00-9. Andrea Pieroni, Maria Elena Giusti, & Cassandra L. Quave (2011). "Cross-cultural ethnobiology in the Western Balkans: medical ethnobotany and ethnozoology among Albanians and Serbs in the Pešter Plateau, Sandžak, South-Western Serbia." Human Ecology. 39. (3): 335. "The current population of the Albanian villages is partly “bosniakicised”, since in the last two generations a number of Albanian males began to intermarry with (Muslim) Bosniak women of Pešter. This is one of the reasons why locals in Ugao were declared to be “Bosniaks” in the last census of 2002, or, in Boroštica, to be simply “Muslims”, and in both cases abandoning the previous ethnic label of “Albanians”, which these villages used in the census conducted during “Yugoslavian” times. A number of our informants confirmed that the self-attribution “Albanian” was purposely abandoned in order to avoid problems following the Yugoslav Wars and associated violent incursions of Serbian para-military forces in the area. The oldest generation of the villagers however are still fluent in a dialect of Ghegh Albanian, which appears to have been neglected by European linguists thus far. Additionally, the presence of an Albanian minority in this area has never been brought to the attention of international stakeholders by either the former Yugoslav or the current Serbian authorities."